This week we spent 2 days at Great Yarmouth Pleasure Beach. Thanks to our annual passes we got wristbands for both days (you can buy tokens rather than wristbands) The Pleasure Beach offers lots of different rides from white knuckle rides to fun rides there is something for all ages. Unlike big theme parks there are not long queues for rides so you can get on lots without the hassle of waiting hours and hours! Disko is a half sitting half standing ride that spins you around and up and down. I like it because it feels like you are flying through the air. Mulan is a fast spinning ride that goes round and round and up and down for ages, a cover then goes over each car and you are then spinning round in the dark. It makes you feel very sick! 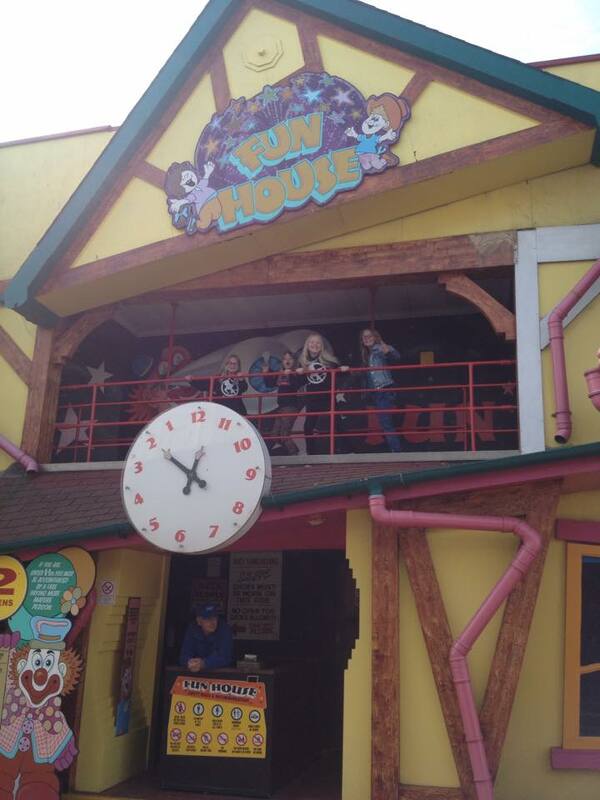 The fun house is an old-fashioned ride where floors move and wobble UV lights make everything white glow and its very noisy with the sound of the floors moving! I like it because we have made different moves to do on each different moving floor. Family Star is a spinning rollercoaster. The carriage spins around as it jerks along the track. There are some big drops which you go down backwards which makes your tummy flip. Evolution is an upside down ride where you spin 20 metres into the sky on its giant arm – as the cars revolve 90 degrees spinning upside down and round and round. Very few people go on this ride so there are never any queues! My first time on it I thought I would fall out but for some bizarre reason I like going on again and again and again. Sky drop is 22 meters tall. You sit and it bounces you up and down it then holds you at the top and you get a great view of Yarmouth it doesn’t last long as it suddenly plummets you back down to the bottom. I like it because it doesn’t feel like its going to stop before you hit the bottom. The Rollercoaster is the oldest ride in the Pleasure Beach it was built-in 1932 and its a traditional wooden rollercoaster. It slowly pulls you up the first steep hill and once the train has left the top it travels under gravity until it arrives back at the start. A ride operator sits in the middle of the roller coaster controlling the brakes! The second drop is the best as it goes so fast and it looks like you will hit your head on the wooden beams ! Its my favourite ride in the Pleasure Beach. Whether you have all day or just a few minutes you can either get a wristband or a few tokens and enjoy as many rides as you want. It may need a good tidy up in places but the rides are worth a visit. Wow looks like you had a fantastic couple of days.